Traditional sweet potato casserole has never been a necessity at our Thanksgiving table– as no one in my house is a fan of marshmallow topping– but it would seem wrong to omit these naturally sweet roots entirely. Which is why I decided to try something new this year! These maple glazed sweet potatoes are bursting with fall flavor, without all of the milk, butter and refined sugar that comes with traditional sweet potato casserole. They’re also less labor intensive to prepare! Featuring pure maple syrup, fresh ginger and a touch of coconut milk, this naturally sweetened glaze will leave no one at the table missing their marshmallows. Preheat the oven to 400F. Combine the ingredients in a large oven-safe skillet over medium heat on the stove, and bring the liquid to a boil. Stir to coat the potatoes well. Transfer the skillet to the oven, and cook for 10 minutes. Stir the potatoes, then return the skillet to the oven for another 10 minutes, or until the potatoes are fork-tender. Sprinkle with salt and serve warm. 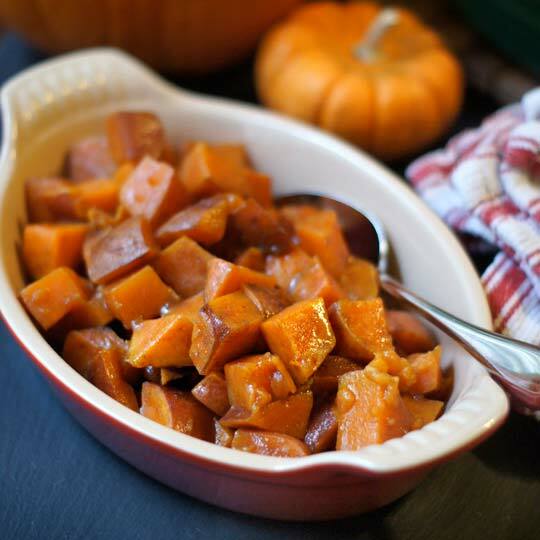 A naturally sweetened sweet potato dish, perfect for the holidays! 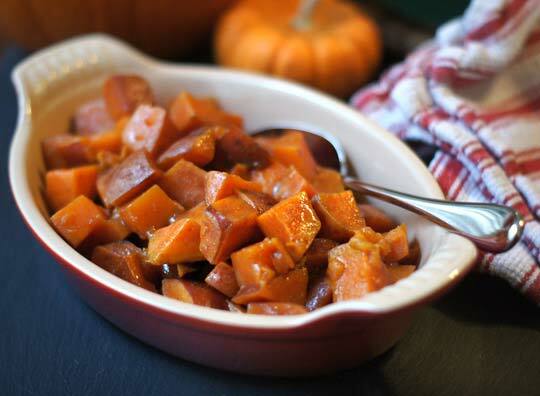 Reader Feedback: What’s your favorite way to serve sweet potatoes over the holidays? Used this recipe to make sweet potato casserole.Used 5lbs of potatoes & multiplied all ingredients according. Everyone loved them! Next time think I’ll try coarsely ground pecans on top too.Yum. I doubled this for a gathering of local farmers tonight, and the dish was quickly emptied. It is fabulous! Followed the recipe as is, I wouldn’t change a thing. Can you make these ahead of time and keep in a croc pot? Yes, I think that would be fine! Omg! Just made these to make sure they will be ok to make on Thanksgiving! So delicious!! I didn’t peel my sweet potatoes, but will next time! I will probably triple the recipe!Thanks for the awesome recipe! Thank you so much for the recipe! Easy to make & is currently in my oven making the house smell so wonderfully!! I’m literary having this for my lunch as I type here! I don’t think I can leave any for others to try! I know it’s quite a lot for one person, but I cannot stop this! So delish! I made these last night and they were delicious! I used full fat canned coconut milk and omitted the ginger. Thank you for a simple , wholesome, delicious recipe! I made these for Thanksgiving and was told that they were the most delicious sweet potatoes EVER! Thanks! Hi, I was wondering whether anyone has tried making this ahead, freezing it and then reheating? Thanks! In the oven now & my whole house smells AMAZING!!!! What kind of coconut milk do you use – the kind that is sold in the dairy case or the full fat kind in cans? Thanks! When I lived in Japan, I used to eat honey-glazed sweet potatoes with sesame seeds (daigaku imo)every fall (YUM). This looks like another fun way to eat them up now that I’m back in the States! I’m trying to watch my sugar intake so I’m thinking of omitting the maple syrup and I also don’t have access to the pure kind. I don’t mind comprising the flavor a little, and I find sweet potatoes to taste delicious by themselves. Do you think it’ll still taste good without the maple flavor? you might get good flavor by adding a bit of maple extract and some other sweetener if you want that extra sweetness (stevia, xylitol, etc…) in place of the maple syrup. I make something similar to this but toss in some raisins during the last few minutes. I love the flavor contrast they add. Our family has never been a sweet potato marshmallow casserole group either. I look forward to trying this version! Do you peel the sweet potatoes? Nope, I left the peel on! But, you’re welcome to remove it if you prefer. Re: the maple glazed sweet potato recipe, what does the coconut milk bring to the recipe? Can I make it without coconut or any type of milk ? This is such a great sweet potato side! I esp. love the inclusion of coconut milk! Thanks! I’m looking forward to making this – maybe even before Thanksgiving :0)! I hope you & your family have a wonderful holiday!